Once Weber decides on a specific grill design, they stick with it, making changes here and there, in a constant surge towards what they believe is grilling perfection. This has been the company’s ethos, since it started in 1952, and it’s served them well, making them one of the largest grill manufacturers in the world. While sometimes the little tweaks they make, don’t work out, they always listen to buyers, and in the event of a mistake, they go back to the drawing board. The purpose of this Weber 741001 Original Kettle 22-Inch Charcoal Grill Review is to highlight the changes and to advise buyers, on whether improvements have been made or whether Weber needs to return to the drawing board. 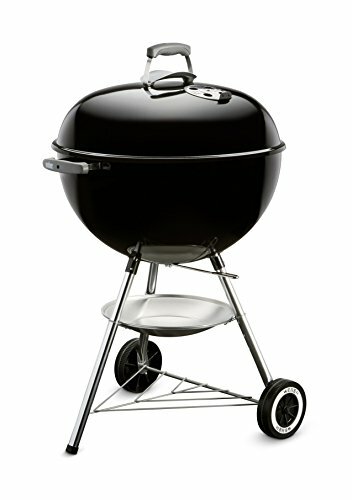 The Weber 741001 has measurements of 25 inches in length, by 20.5 inches of width, and stands at a height of 38.5 inches. These are pretty standard measurements for a Weber Kettle Grill and so is the weight at 31.5 pounds. The aim in grill manufacture is to use quality materials, without creating a product of excessive weight, because buyers will often be assembling their grill, in a different place, or part of the house, than where they will be cooking. Weber has largely achieved this balance between quality and weight, with this aluminized steel design that is resistant to rust, and light enough to carry around. The wheels make moving the 741001 even easier and buyers will be happy to know, they’re the same, well-made wheels, Weber has used on their other Kettle Grills. I’ll start with the first piece of good news; the 741001 comes practically assembled, and all one needs to do is connect the bowl and lid to the frame and you’re done. I’ve never met anyone who enjoys grill assembly, so this will be a relief to buyers. The grates, on the other hand, are a mixture of good and bad news. On the one hand, they are hinged, which is a great innovation by Weber and it’s one that seems to be included on most new Weber grills these days. Hinged grates are very convenient because if you need to put more charcoal in, or adjust charcoal in the grill, you don’t have to take the grates right off; instead, you just lift them up. Its a practical, common sense measure, to make grilling easier. Other good points about the grates are that being made of plated steel, they’re durable and won’t burn or rust. The downside of plated steel grates is that they aren’t as good at retaining heat is cast iron grates are, so they will under normal circumstances produce more sear marks on the meat and heat that is not completely even. However to counter-balance this, and to perhaps lessen the effects of this problem, Weber has created a great air-flow system inside the bowl. Also made of steel, the bowl and lid system has been specifically designed to make heat circulate easily around the cooking area. An air-flow system like this means the steel grates won’t necessarily be a problem. The damper system allows buyers to further control heat inside of the bowl, and also to experiment with different types of cooking, and as per usual with Weber, the dampers function efficiently. One thing that might trouble some buyers is the closed cooking system, as many who haven’t owned a Weber Kettle Grill might be used to seeing their food cook in the open air. If you’re not comfortable with closing the lid and leaving meals to cook, perhaps this isn’t the product for you. That said, the 363 square inch cooking area provides a lot of space, and cleaning is easy as the whole thing is coated in porcelain aluminum. The grates weren’t what I was hoping for, but Weber has succeeded in every other design area. Buyers are getting, for a good price, a large cooking area, hinged grates, aluminized steel, great dampers, and an air-flow system that is one of the best out there. The result is excellently cooked food, so I would recommend Weber 741001 for a purchase.